I love the Christmas season. I love decorating my house, putting up lights, making cookies and shopping for the perfect gifts. There is one tradition that my family has had since I was a little girl, that as an adult, I don’t love quite as much. Making Gingerbread houses. As a kid, I loved this. It was always so much fun and I was always so proud of what I made. As an adult, in the years past, it hasn’t been quite as fun. In fact I have more memories as an adult of it being stressful than it being fun. Why is it so stressful, you ask? Maybe you don’t have to ask because you completely understand! Every year we have the struggle of trying to build a gingerbread house where the house hasn’t fallen down by the time you are done with it. We have used gingerbread, graham crackers and more and have tried every frosting recipe there is, but someone, our gingerbread houses don’t like to stay standing! Yep. I have a tip for you. When you hear this tip, you are going to say, why didn’t I think of that. It is PURE GENIUS! I can’t take credit for it, though, I heard it from my sister-in-law, who heard it from a friend, who probably heard it from a friend and so on. 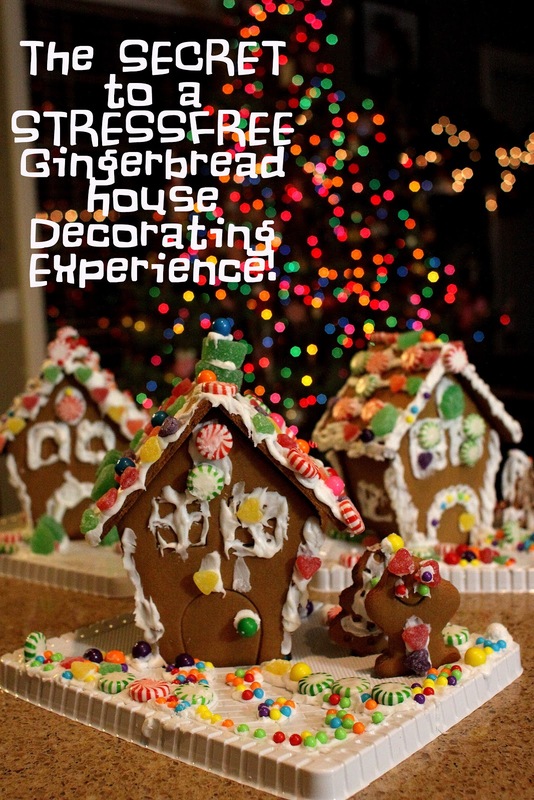 So here you go…the most awesome tip for a stress-free gingerbread house decorating experience. 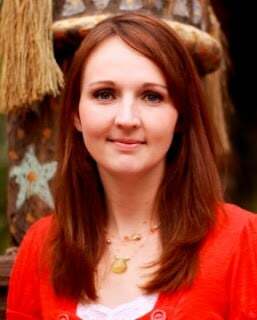 Okay, here it is. We bought our kit at Walmart. It came with everything we needed to make houses. We bought three so each of my kids could make one. Here is the problem. We have bought these in the past and the frosting didn’t hold. Disaster. We thought we would try again. With our GENIUS tip. 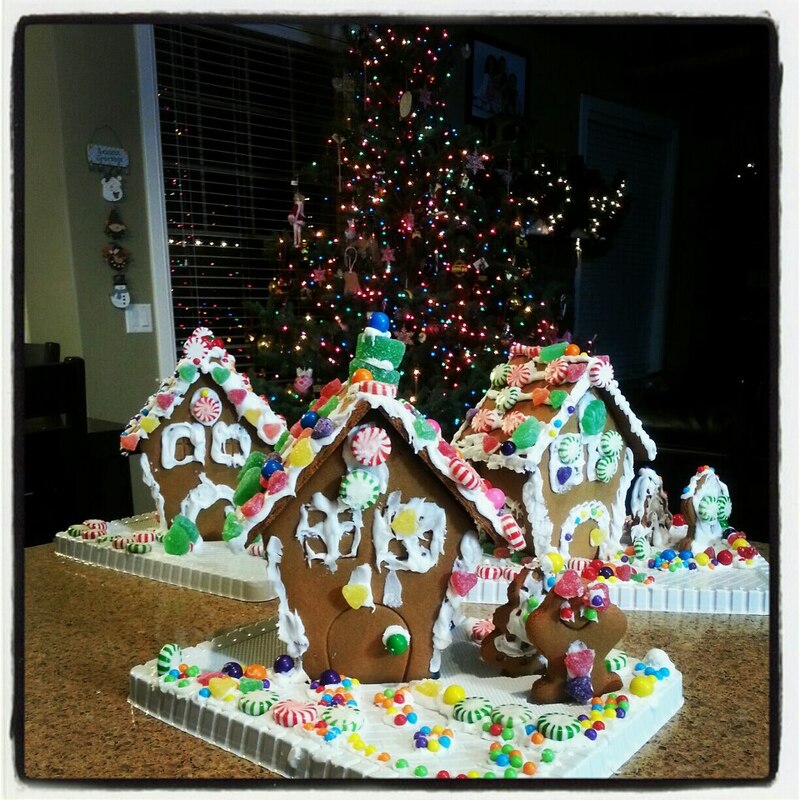 It was a smooth flowing, stress-free Gingerbread House decorating experience. I told you. I’m sure your first thought was WHY DIDN’T I THINK OF THAT!!!? Thats right. Grab your glue gun and GLUE your house together. My husband built all three houses in less than 10 minutes. They stayed together perfectly and then the kids were able to easily decorate! Yep… a GLUE GUN! 🙂 You will cover all these spots with frosting and candy when you are done! Just add glue down the piece and glue both pieces back together. Once you use frosting and decorate, you can’t even tell! Yep, stress-free. Look at all these free standing homes! This will definitely be how we decorate from now on. 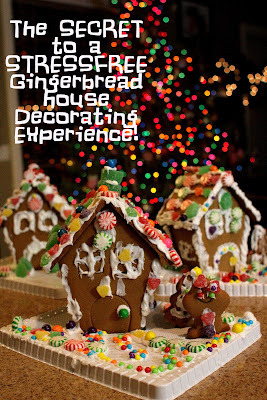 I think that this made it more fun for the Kiddos because we were able to hand them each a bag of frosting and they could start decorating without their house falling down! It works best if you frost first and then add your candy. We covered up all of the spots where we used glue with frosting and you couldn’t even tell. None of our houses fell down and they were all sturdy and easy for the kids to decorate!